Last Sunday I wrote a piece about the mainstream media jumping the shark. It was a strange coincidence to wake up on Monday to an announcement that Fairfax was restructuring. Then on Wednesday News Ltd unveiled their own version of restructuring – using revenue from their television business to prop up their newspapers, or ‘LNP how to vote cards’ as I like to call them. For a fleeting moment I thought both media giants had come to the same conclusion I had – that their current business practices weren’t working. Maybe they had realised that their strategy of appealing to the lowest common denominator by ignoring the success of the Labor government, undermining Julia Gillard, covering scandal without analysis and generally fear mongering in order to sell newspapers, was not working. But alas, this was just my delusional optimism showing through. Fairfax and News Ltd aren’t concerned with their editorial quality. They’re concerned with their profits. On Tuesday, one of my favourite bloggers, Greg Jericho, wrote a post on his incredibly popular blog, Grog’s Gamut, about how he no longer trusts what he reads in mainstream media. His example of the reason for this loss of trust was a beat up by The Australian’s Dennis Shanahan about Julia Gillard at the G20 Summit. Greg makes a very good point. The loss of trust in mainstream media is exactly the reason why I think the industry has jumped the shark. The only difference between my reasoning and Greg’s, is that I never trusted News Ltd in the first place. But, as with close personal relationships, it’s those we love who hurt us the most. My loss of trust in the ABC and Fairfax has been far more devastating, because it not only leaves me mistrustful of all Australian mainstream press, but also reduces my breakfast options. (I eat news and analysis for breakfast. Thankfully independent bloggers are filling the void). Portrayal of Gillard’s Government as ‘unsuccessful’. Reporting Climate Change science as a debate, instead of a scientific consensus. Encouraging the incorrect perception that we are being ‘flooded’ with ‘boat people’ and ignoring the fact that it is not illegal to seek asylum. Since analysis of these three issues could take up 1000 posts on 100 blogs, I’m going to stick with number one for this post. Number two has been comprehensively outlined in this post by Andrew Kos on Independent Australia. I’ll cover number three in coming weeks. I understand it might not seem sensational for a journalist to say ‘in actual fact Gillard’s government is performing very well and have managed to deliver most of their progressive policies despite the challenges of minority government. The Carbon Tax, the Mining Tax, the National Broadband Network are just three examples of policy success for Gillard’. But this is the truth of the situation. So why don’t journalists say it? This is a fact. 362 – 0. That’s a thrashing in anyone’s sport. How is it possible for the mainstream media to continue with their myth that the Gillard government is unsuccessful? Pot kettle black Michelle. And what’s this about the report being blown out of proportion? Surely that was your unnamed News Ltd journalist’s aim in writing it? Michelle may have jumped her own shark with this piece. Only the day before, Michelle’s colleague at Fairfax, Philip Coorey, contributed this nothing report about, you guessed it, Labor leadership tensions. But we must forgive Philip. A panic attack perhaps? He’s quite obviously lost it, as evidenced by this Tweet. And by the way Phillip, we know your sub editors can spell, but have no evidence that you can. I used to really respect Phillip Coorey. It’s a shame he too appears to have jumped the shark. 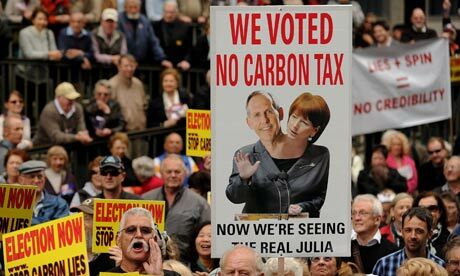 Before the election, Gillard promised that there would be no Carbon Tax under her government. She instead promised an ETS, and anyone who voted for her in 2010 would have been expecting her to take action on climate change in this way. After the election, as part of Gillard’s negotiations with the Greens, she made the decision to bring in a Carbon Price for three years, before converting it to an ETS. Yes, she did change her mind because of the circumstances of a minority government. It would be untrue for people to say that they were misled by Gillard, and wouldn’t have voted for her if they knew she was going to bring in a Carbon Price, as she was promising an ETS, which we eventually will get. Those who are most upset about the Carbon Price are very unlikely to be upset about it because it’s not an ETS. And they are very unlikely to have voted for Gillard in the first place, especially since most don’t appear to believe in anthropogenic climate change, and nor do they see a need to do anything about it. ‘The statements that need to be taken absolutely as gospel truth are those carefully prepared, scripted remarks’. Not to mention Abbott’s part in a government that brought us the children overboard lies, the AWB bribery scandal and an entirely fictitious reason for going to war in Iraq. As far as the mainstream media are concerned, it’s ‘nothing to see here, move along’. Denise Allen has provided a fantastic commentary on Independent Australia about the strange phenomena of people believing Tony Abbott which is well worth a read. Failed? What? Yes, she hasn’t got her Malaysian solution, but that battle isn’t over. And as of July 1st, in one week’s time, Australia will have a Carbon Tax and a Mining Tax, just as Gillard promised. What is this failure you speak of Marius? Is it anything more than a failure in the opinion polls? And if so, why is Gillard having such trouble communicating her successes? It wouldn’t be something to with the media would it? Marius, you too have jumped the shark. Like you, Victoria, it is the ABC. that has disapointed me most. Talk about trust, they have betrayed the trust we havwe placed in them by travelling down the “stupid” road. Who the hell do they think they are broadcasting to?…It is not the “bogan urbans” that tune in, Lady Gaga fixes them for the day! Thank christ for the bloggers, it’s now where I go to first for news. If it appears in any of Rupert’s Rags, and i include the ABC in this, i know it’s a lie. I haven’t bought a paper for ages, now and I couldn’t be happier about it. I have everything crossed that Liealot’s mob will get the flick next year and every day I read about what a mess the Liars are making in WA, Victoria, NSW and Qld, I feel confident that having them in power in Canberra will just be too sickening for most voters. I have to say that the minority government has been very successful. I have a great deal of respect for Oakeshott and Windsor, although I think Wilkie’s a bit of a wild card, but it seems even though he’s got the huff with Gillard, his distrust and dislike of Liealot is greater.